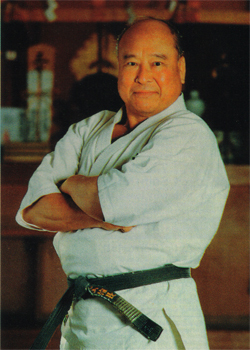 The founder of Kyokushin Karate, Masutatsu Oyama, was born in 1923, began studying kempo at the age of nine and had attained the first level of proficiency (shodan) by his second year in middle school. In 1928, while enrolled at the Yamanashi Youth Aviation Institute, he began studying at the martial-arts hall called the Shotokan, which was headed by Gichin Funakoshi. At the age of seventeen, he had attained second dan. In 1941, he matriculated to Takushoku University and, in 1943, began studying with So Nei Chu, a leading figure in the Goju karate world of the time. By the age of twenty, he was fourth dan. In 1945, he volunteered for service in the perilous special attack corps of the Japanese army and was sent south, where the fighting was taking place. But soon World War II ended. In 1946, he isolated himself in a temple on Mount Minobu and trained karate for a full year. After having taken first place in the initial postwar all-Japan championship tournament, he decided to devote the rest of his life exclusively to this martial art. In 1948, he constructed a crude hut for himself on Mount Kiyozumi, in Chiba Prefecture, and once again trained strenuously, this time for a year and eight months, during which he fed himself on grasses and berries. After coming down from the mountain, in 1949, in order to train in breaking horns from bulls, he took up residence not far from a slaughter yard. During his stay there, he broke the horns from fifty bulls. In 1952, together with Kokichi Endo, an outstanding judo expert, he traveled to the United States, where he gave 270 exhibition matches and appeared on television 7 times. Such things as his ability to break whiskey bottles with his bare hands surprised the Americans and earned him the nickname “The Divine Fist.” He was challenged by two American professional boxers and one professional wrestler and beat them all. Since that time, he has traveled extensively teaching and giving lectures in America, Europe, and Southeast Asia. In 1953, Sosai Oyama opened his first “Dojo”, a grass lot in Tokyo. By 1957 there were real facilities and 700 members, despite the high dropout rate due to the intensity of training. The World Headquarters were officially opened in June 1964, where the name Kyokushin, meaning “Ultimate truth”, was adopted. From that point forward, Kyokushin continued to spread to more than 120 countries around the world, and registered members exceeding 10 million, making it one of the largest martial arts organisations in the world. In 1977 Sosai Oyama visited Australia for the first time to attend the first Australian full contact tournament held at the Sydney Town Hall. Sadly Sosai Oyama passed away on April 26 1994 at the age of 70 due to lung cancer. 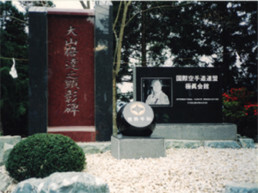 According to his wishes, as expressed to many of his senior students, Shokei Matsui was made Kancho (Director) of the International Karate Organisation.